Qantas made history with the launch of the first non-stop flights from Perth to London. At approximately 14,500km in distance and a flying time of 17 hours, the direct Dreamliner service is the longest flight on the Qantas network, beating out the 16-hour trip from Sydney to Dallas, which previously held the honour. Amenities and a seamless experience are at the core of the new development and are evident in all aspects of the design. Travellers can now enjoy smoother connections between all Qantas and Jetstar domestic flights and services to Singapore, Auckland, and London, thanks to a streamlined immigration and customs area. While waiting for their flight, travelers can take advantage of the first outdoor patio at an Australian airport, a Neil Perry-designed barbecue menu, and duty-free shopping. There is also a new international transit lounge, which has over a dozen shower suites and a wellness facility. The design team at Geyer, together with the development team at Rynat considered Corian® Solid Surface a critical piece for the new bathrooms. 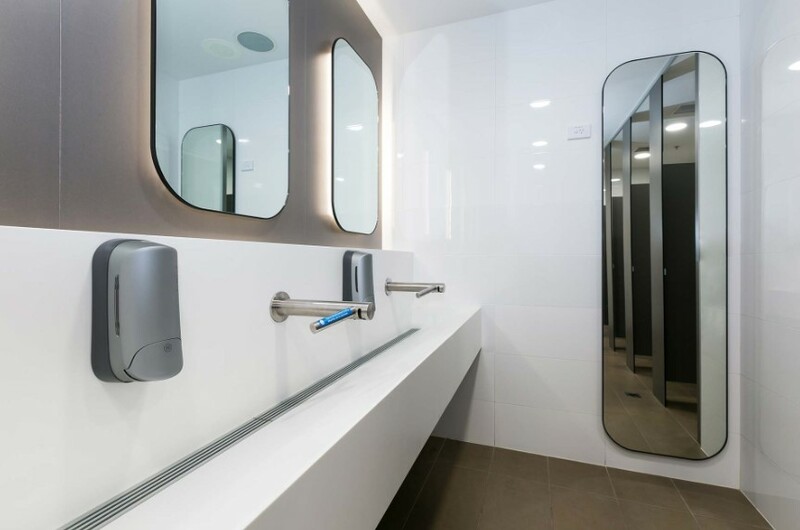 The bathrooms needed to meet the demands of elevated user traffic levels, and, at the same time, reflect the innovative, future-facing focus of Qantas. 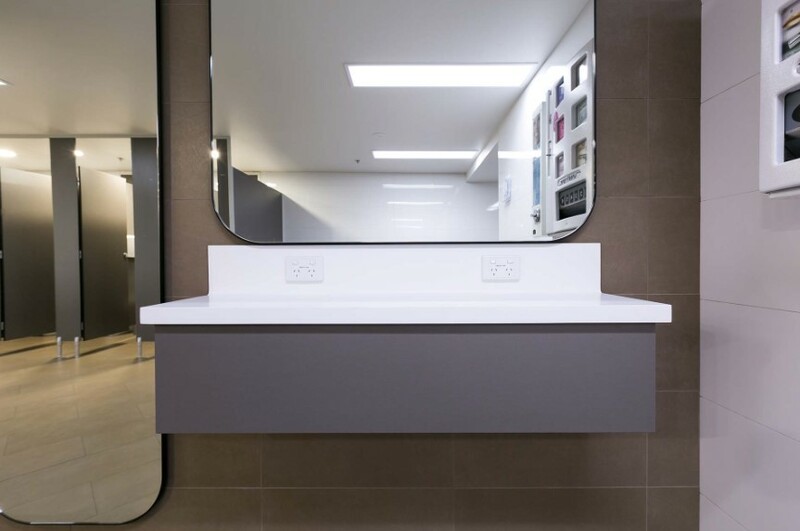 The robust and design friendly Corian® Solid Surface allowed this brief to be met with ease, delivering a level of amenity that matches the landmark development in every way-world class, sleek, and the best that Perth has to offer. 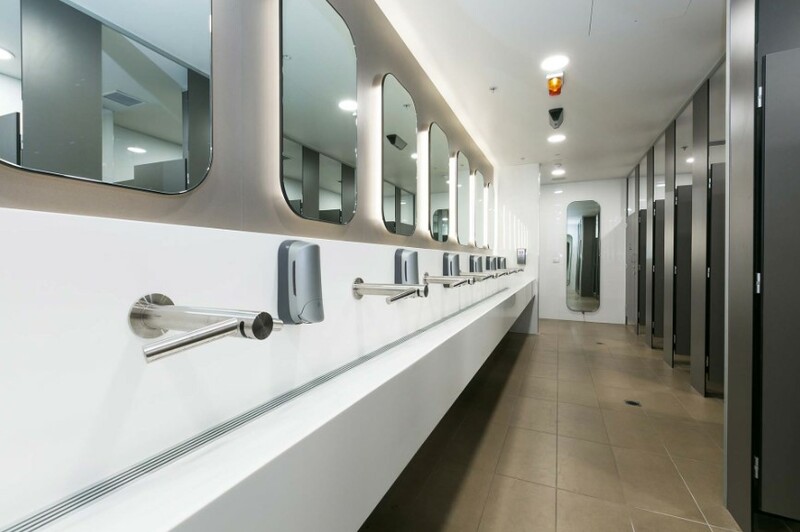 Stunning Corian® Solid Surface Glacier White was used for all of the terminal’s bathrooms. Well suited to the demands of the high traffic environment, Corian® Solid Surface provides a striking, seamless sink and hand washing experience. Fully integrated Dyson Airblade™ taps allow travellers to wash and dry their hands at the same location, significantly reducing overall time spent in the bathroom and reducing cross-over traffic between sinks and hand dryers. The result of this bathroom design is a more efficient and cleaner than the typical bathroom, with reduced trip hazards and lower energy consumption. Taking advantage of the unique thermoformable nature of the Corian® Solid Surface, the new terminal also features continuous Corian® baby changing tables. Combining contemporary elegance with a high degree of practicality, the undulating baby changing tables are non-porous and free of joints, providing a seamless, hygienic finish. Corian® Solid Surface retains its much-lauded versatility with the innovation of a waved surface, which in turn provides side-by-side bays to service the needs of multiple parents simultaneously. 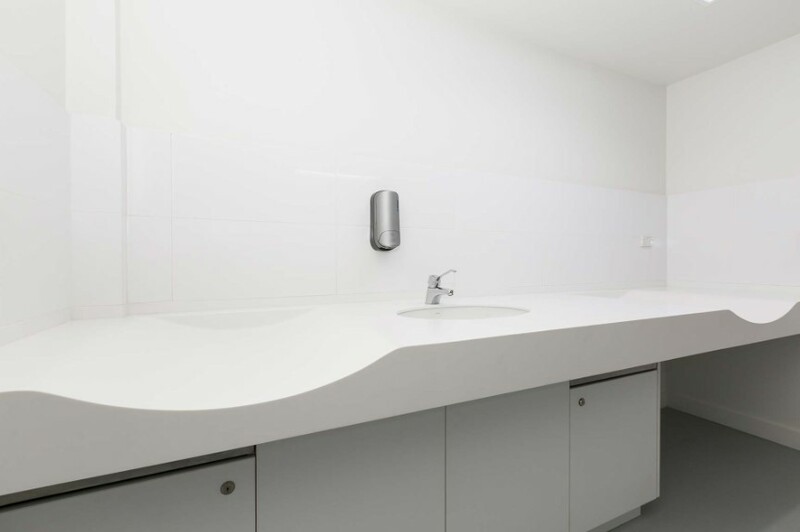 Non-porous and free of joints – Corian® provides a seamless, hygienic finish. 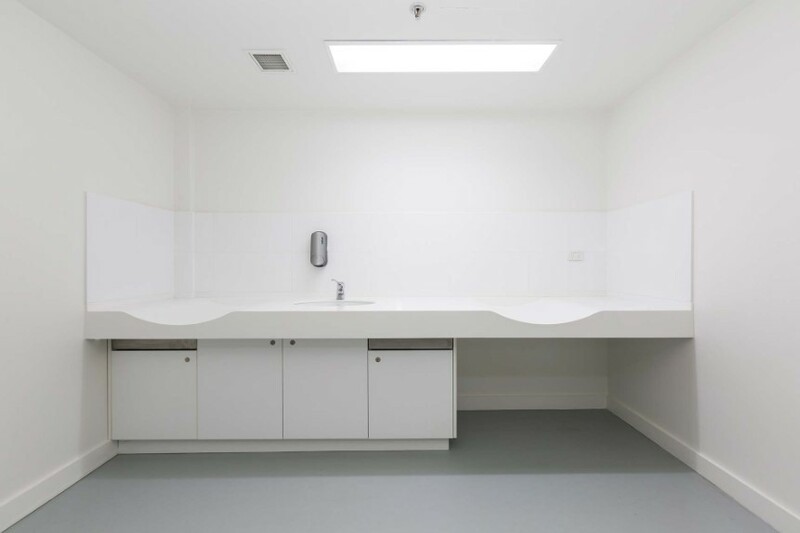 Corian® Solid Surface is entirely waterproof & antibacterial, which makes it an ideal choice for use in hospitals, laboratories, restrooms & surgical areas among other places that require 100% hygiene. The overall effect is one of unparalleled functionality, ease, and smooth transition, making Corian® Solid Surface the perfect complement to the terminal itself.